You can find this wheel in Qasala. 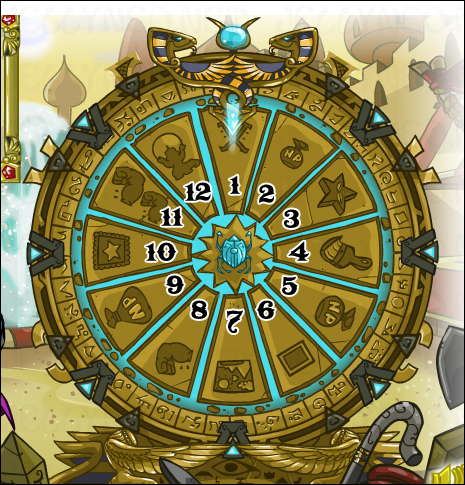 This wheel costs 100,000 NP to spin! You can spin this wheel once every day. 2 You win 25,000 NP! 3 A random Nerkmid, Secret Laboratory Map piece, or job coupon. 4 A paint brush (e.g., Mystery Island Paint Brush, Zombie Paint Brush). 5 You win 50,000 NP! 6 Wheel of Extravagance avatar. 7 The Wheel of Extravagance Background. 8 +5 of a random statistic (e.g., hit points, strength, defence, movement, intelligence) for your active pet. Does not increase level. 9 You win 100,001 NP! 10 The Wheel of Extravagance Stamp. 11 +10 of a random statistic (e.g., hit points, strength, defence, movement, intelligence) for your active pet. Alternatively, it could be a 10% increase if your pet's stats are fairly low to begin with. Does not increase level. 12 A rarity 100 item (e.g., Chocoon, Glittery Scorchstone). Certain factions give the opportunity of activating the Right Round Round Round boon if you side with them and they emerge victorious from the Battleground of the Obelisk. When selected, this boon allows you to spin the wheel twice before the usual waiting period comes into effect. You have to refresh the page after your first spin before you can spin again. Land on the "blank square" space on the Wheel of Extravagance. This page was last updated on August 2, 2018.